The event was instituted in 1962, when the 1st World Pairs Championship took place in Cannes, Fritzi Gordon and Rixi Marcus from Great Britain, were the first champions. 1. Veronique Bessis – Anne-Laure Huberschwiller (France). 2. Kathy Sulgrove – Candace Griffey (USA). 3. Yan Huang – Nan Wang (China). 1. Liu Shu, Zhou Tao (China). 2. Huang Yan, Gan Lin (China). 3. Suci Amita Dewi, Kristina Wahyu Murniati (Indonesia). 55 Pairs entered for the Women Pairs Championship. 1. Lynn Deas – Beth Palmer. 2. Susan Culham – Kismet Fung. 3. Carla Arnolds – Bep Vriend. The Generali World Women’s Pairs had an entry of 58 pairs. 1. Irina Levitina & Kerri Sanborn. 2. 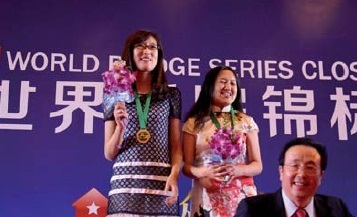 Wang Wei Fei & Wang Hong Li. 3. Sabine Auken & Janice Seamon-Molson. 81 pairs entered the Women’s Pairs. A three stage event: a five-session qualifying stage to send 54 pairs to the five-session semi-final, and a four-session barometer final. 1. Karen McCallum – Debbie Rosenberg (USA). 2. Anne Frédérique Levy – Blandine de Hérédia (France). 3. Kerri Sanborn – Irina Levitina (USA). The Women Pairs had only 99 participating pairs, with a qualification stage of four sessions. The small entry in the Zonal Women’s Pairs led to the pairs being integrated into the Zonal Open Pairs Championship. The winners were Val Bloom & Maureen Holroyd from South Africa. 1. Shawn Quinn – Jill Meyers (USA). 2. Sabine Auken – Daniela von Arnim (Germany). 3. Véronique Bessis – Catherine d’Ovidio (France). The Louis Vuitton Women’s Pairs drew 119 initial entries. 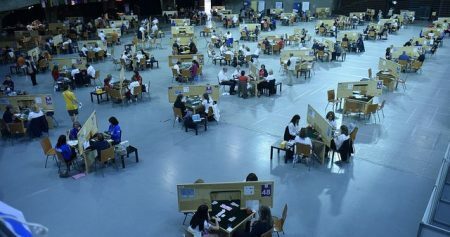 The event was run in three stages with a four-session qualifying round, a four-session semi-final, and fivesession final, with drop-ins to the semifinals and final permitted from the main team event. 1. Carla Arnolds – Bep Vriend (The Netherlands). 2. Véronique Bessis – Catherine Saul (France). 3. Lynn Deas – Beth Palmer (USA). The NEC Women’s Pairs attracted 132 entries. The event was run over three stages: a four-session qualifying round, a four-session semi-final, and five-session final, with drop-ins to the main event. 1. Karen McCallum – Kerri Shuman (USA). 2. Judi Radin – Kathie Wei (USA). 3. Carla Arnolds – Bep Vriend (The Netherlands). The Labatt’s Women’s Pairs produced a very tight finish. 1. Amalya Kearse – Jacqui Mitchell (USA). 2. Charlotte Palmund – Bettina Kalkerup (Denmark). 3. Sally Horton (now Brock) – Sandra Landy (Great Britain). The Women’s event went to a newly formed US pair who barely survived the qualifying round. 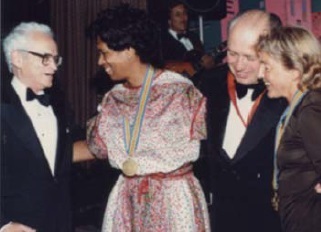 Thereafter, Amalya Kearse and Jacqui Mitchell (picture) steadily raised their game, the win establishing Mitchell as the world’s top woman Master Point holder at that time. 1. Betty Ann Kennedy – Carol Sanders (USA). 2. Lynn Deas – Beth Palmer (USA). The Women’s pairs was won, in a great feat of consistency, by a pair narrowly second four years earlier. 1. Judi Radin – Kathie Wei (picture) (USA). 2. Betty Ann Kennedy – Carol Sanders (USA). 3. Claude Blouquit – Elisabeth Delor (France). 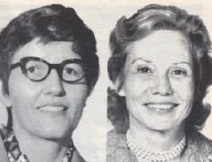 In the 74-pair Women’s Championship, the battle for the title was contested by two pairs who, as team-mates, later posted a series of outstanding wins in the world events. 1. Fritzi Gordon – Rixi Markus (Great Britain). 2. Gerda Goslar – Rita Jacobson (South Africa). 3. Emma Jean Hawes – Dorothy Truscott (USA). 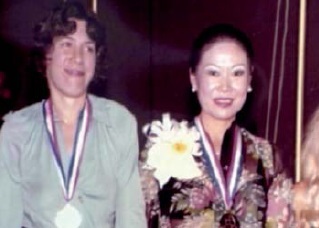 The Women’s Pairs was won by a margin of seven boards, a feat unparalleled in the annals of world competition, by Fritzi Gordon (piture) – Rixi Markus (Great Britain). This gave the victors the remarkable record of two wins and a second in three World Pairs Championship appearances. 1. Mary Jane Farell – Marilyn Johnson (USA) (picture). 2. Fritzi Gordon – Rixi Markus (Great Britain). 3. Britt Bloom – Gunborg Silborn (Sweden). The championships were played consecutively with the Bermuda Bowl in Stockholm. Appropriately – for their country of origin was Sweden – bidding boxes made their first appearance in world championship play. Scoring across the field was used. Computers enabled frequencies to be flashed onto a large screen visible to all the players well before the next round was finished. The ranking followed only a few minutes later. The Women’s pairs was attended by 72 pairs. Mary Jane Farell added another title to her already impressive World Championship record. 1. Joan Durran – Jane Juan (Great Britain). 2. Nancy Gruver – Sue Sachs (USA). 3. Mary Jane Farell – Peggy Solomon (USA). The Championships, held in Amsterdam, were contested by 29 nations and a Mixed Pairs event was included. An overall trophy was instituted. 44 pairs contested the Women’s Championship. For Jane Juan (Jane Priday) this was the completion of a notable double, as she was already reigning Women’s Teams Olympiad champion. 2. Fanny Pariente – Marianne Serf (France). 3. Dorothy Hayden – Helen Portugal (USA).